Snowfall and icy conditions are expected to cause widespread travel disruption in many parts of the UK after temperatures plummeted as low as minus 15.4C overnight. It was coldest night in the UK since 2012. 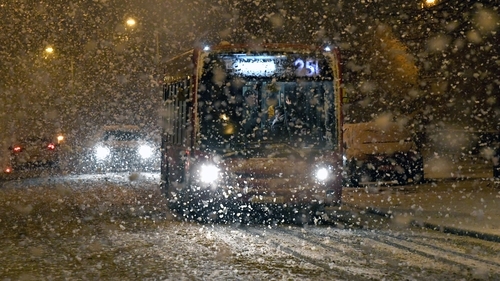 The alert comes after as much as 14cm of snow caused chaos in the southwest yesterday. More than 100 people were forced to take refuge at a pub high on Bodmin Moor in Cornwall after the heavy snowfall forced motorists to abandon their cars on the A30. Meanwhile, persistent snow began to spread across the south east late last night were seen all the way into central London. The Met Office has also issued two yellow weather warnings of snow and ice in force until this afternoon covering southern England and Wales, as well as the eastern edge of the UK from Shetland to The Wash.
Aer Lingus said it plans to operate a full service to the UK, however there may be some delays due to weather conditions and passengers should check the status of their flight before travelling to the airport. Snow was also seen falling at Heathrow, where British Airways altered a number of short-haul flights yesterday, and passengers using the hub were being told to stay in contact with their airlines before travelling. Met Office meteorologist Emma Smith said: "There is still sleet and snow across southern counties, the band is currently sitting across the south-west and Wales and across to East Anglia and London. "It's kind of pivoting in place and it's not really moving very far. What will be happening to it is it will get patchier as it goes on, but it could cause some disruption to rush hour. "Temperatures are widely below freezing so there's icy stretches so people will have to take care going into work." The Met Office said a low of minus -15.4C was recorded just before midnight at Braemar in the Scottish Highlands.